In the past, few months before the dot com burst in 2000, some analyst predicted Yahoo to reach $600 price target but it was never reached. 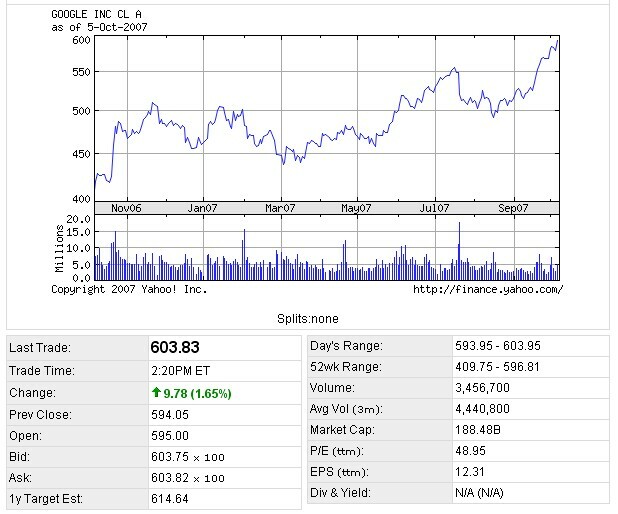 On the first day of trading in 2006, analyst Safa Rashtchy from Piper Jaffray predicted Google to reach $600. I remember reading an article how some analysts are skeptical about the prediction. I briefly capture a screenshot of GOOG price at $603.83. Now some analyst predict Google share will reach $700 by end of 2008. Way To Go Google !! I read about this here in our sydney newspaper. It looks like google are getting bigger and bigger.